Also known as "pouchang", this tea is slightly in-between green tea and oolong tea. It has a darker flavor than green tea, with a slight minty taste and a hint of oolong flavor. Steep 3 tsp at 212 °F for 9 min. Steeping at a lower temperature misses flavor. 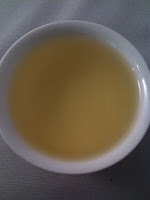 Pouchong - Bāozhŏng chá is a light oolong. It is a lightly fermented (oxidized) tea, twist shape, with floral notes, and usually not roasted. 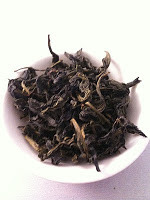 It is somewhere between a green tea and what is usually considered oolong tea - Black Dragon. Although often classified with the latter due to its lack of the sharper green tea flavours. It is produced mainly in Fujian, China, and in Pinglin Township near Taipei, Taiwan. Its name in Chinese, literally "the wrapped kind." It refers to a practice of wrapping the leaves in paper or usully bamboo leaves during the drying process that has largely been discontinued due to advancement in tea processing. At its best, Pouchong gives off a floral and melon fragrance and has a rich, mild taste. Usually around the end of March, begins picking of this famous Taiwan "spring tea" (春茶). Pouchong is usually made into scented teas, rose pouchong being a particular favourite.